Action fron Deeping Ragers' 1-0 win over Newport Pagnell at the weekend. Photo: Tim Wilson. A big week of cup action for Yaxley kicks off tonight (December 8) with a home Hinchingbrooke Cup quarter-final against Oakham United. The Cuckoos, who are ninth in the United Counties Premier Division, will start as favourites to beat their Division One visitors, and they will be keen for a morale-boosting win before tackling top-flight rivals Sleaford in the third round of the FA Vase at In2itive Park on Saturday (December 12). Wisbech Town are also in cup action tonight as they seek a second big scalp in four days. Wisbech host Ryman League side Soham Town Rangers in the quarter-final of the Cambs Invitation Cup hoping to replicate their win over United Counties Premier Division top dogs Leicester Nirvana in the League Cup at the weekend. There’s a tasty Premier Division derby tonight as in-form sides Deeping Rangers and Holbeach United clash at Outgang Road. Rival managers Michael Goode and Darren Jarvis were co-bosses at Peterborough Northern Star last season. A win for fifth-placed Deeping would take them above third-placed Holbeach. 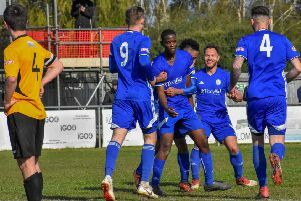 In Division One all-conquering Peterborough Sports are anticipating one of their tougher games of the season when fourth-placed Potton United visit PSL. Sports have an eight-point lead at the top after winning all 15 of their league matches so far. Blackstones seek to make amends for one of their worst displays of the season (they were beaten 3-0 at home by Lutterworth on Saturday) by achieving a positive result at Thrapston. Thrapston threw away a two-goal lead in the final two minutes at Bourne at the weekend.